WHAT IS A BOARD BRIEFING? At a board briefing, the Dallas ISD School Board discusses items they will need to vote on in upcoming meetings. They also hear reports from the Superintendent & the Dallas ISD Administration on ways in which the district is meeting student needs. Below is a summary of the 5-hour briefing on April 11, 2019. WHAT DID THE BOARD DISCUSS AT THE APRIL BRIEFING? 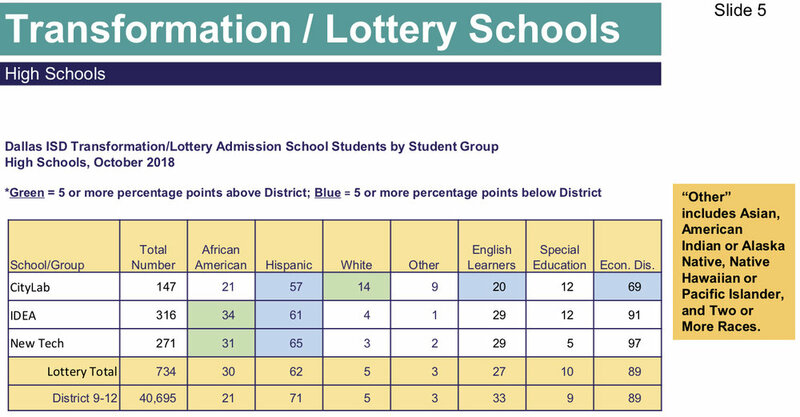 Dallas ISD administration has a plan to address two student groups that underperform: 1) rising 3rd , 6th , and 9th grade African American students 2) English Language Learners. The plan is to put in a place an intensive, targeted summer experience for students that includes touchpoints throughout the year. There are 750 eligible students (based on multiple measures of student achievement data). The rising 3rd graders will be meeting at O.M. Roberts + R.L. Thorton. The rising 6th graders will be meeting at Dade MS + Atwell MS. The rising 9th graders will go to UNT Dallas. By May 10, Dallas ISD admin plans to select the teachers who will participate (those with ratings of Proficient I or higher and experience in Reading and Language Arts). Included in the teacher selection is a commitment to include specialized dyslexia teachers to address student needs in a targeted manner. By May 17, the District will determine student acceptance into the program. Once students are selected, the district will crease student profiles with multiple measures to identify specific needs. Finally, the District will prepare professional development for teachers during the week of May 31-June 6. Trustee Marshall: Want to make sure we take the opportunity to identify and diagnose students with dyslexia. Trustee Foreman: Will students be broken out or in same class? We will have a dual language class and general education class. Please keep the 12:1 ratio. I’d like to know how many 3rd graders have gone through PreK program and are not on-reading level. Want to make sure 9th graders have intensive focus. Trustee Micciche: There are summer loss programs that are part of the City of Dallas, let’s work together to make sure we get as many students as possible into high-quality programs. Trustee Henry: Want to ensure students have values/soft skills they can transition back to home school when the school year begins. Trustee Blackburn: Glad to see we are explicitly addressing African-American students. Need to engage families. Trustee Flores: Working with Racial Equity Office? Yes. Continuous and ongoing review of TEI appraisal tool components to ensure transparency and equity. Revise distribution of teachers to recognize 1) teacher growth and 2) improved student outcomes. Conduct annual review of compensation model structure to ensure market competitiveness and leverage strategic compensation for retention. Allow effectiveness levels for to remain frozen for one additional year for those seeing a decrease. Grandfather salaries for Exemplary II teachers, expand Master Teacher role. The budget for 2019-2020 is $17.1 million and the administration is asking the Board to accept a proposed $30 million. A part of these recommended changes is to ensure strong communication plan for all stakeholders to understand the elements of TEI. The District plans to leverage TEI experts who will partner with campus leaders and provide on-campus training for system changes. In addition, the District will launch teacher-focused deep dives and expand the DTR Ambassador Program. Trustee Foreman: Concerns with forced distribution where bottom 3% of teachers receive low ratings. We are changing the rubric too often. Please share changes to student survey. How many DTR teachers? 2,100. DTR teachers do not have to apply every year. DTR teachers are Proficient II or higher. Salary schedule for experienced teachers? Ability to negotiate salary to match what they received outside of District. Trustee Pinkerton: Very happy to see changes to Kindergarten teacher evaluation. However, TEI is not a best-practice system. I ask the Board to consider a different system. The counselor to student ratio in 2018-2019 is 1 counselor for every 399 students. The projected ratio for 2019-2020 is 1 counselor for every 377 students. Historically, Dallas ISD’s highest ratio has been 1:651 and its lowest ratio 1:201. The District is working to assess and diagnose the following: review job description and duties, prioritize responsibilities, conduct flow chart analysis of counseling accessibility, and propose recommendations to superintendent. Trustee Micciche: Want to see what we can do to bolster number of counselors we have. Trustee Pinkerton: Want to recognize connection between counselor support and student outcomes. Trustee Marshall: Definitely an area we want to invest in. Trustee Flores proposed amendments to the Board Policy for Board Member Ethics (see link above). Trustee Flores shared that the purpose of the policy is to reduce bullying by Board members of Dallas ISD staff. Trustee Flores: Existing ethics policy has not prevented that behavior. The policy would give the Board a tool against these items, including censure. Trustee Foreman: Do not believe Board members should go to Board President when they have concerns about Board member performance. Need to be cohesive, not divisive. Trustee Pinkerton: Could strengthen ethics policy. Do not favor including a censure mechanism in policy. d. Marshall: Currently do not have a mechanism for holding Board members accountable and not engaging in inappropriate behavior. Would want a tool. Trustee Henry: If we can’t do it on our own, then we need a policy to set high expectations. Kids should be able to come to our meetings and say, this is a high functioning board. They respect each other, they remind me of my teachers. We should be a body that can act respectfully in agreements and in disagreements. Have we built a culture and environment to work issues out and talk to one another? The way this policy is written now, this is not going to work. There has to be enough respect to be able to sit and talk to work through whatever issue it may be. For full video clips of board discussion or for a closer review of each agenda item. please visit the Board Docs site with all public materials. Questions/Comments about this summary? Email info@dallaskidsfirst.org. At Dallas Kids First, we argue that the most important elected official is the school board trustee. Yet, it is not a priority for the majority of Dallas voters. If this is a statement that you disagree with – it is likely because you are included in the 7% average voter who shows up for school board elections year after year. For the other 93%, elected school board leadership just isn’t on their radar. First – School board trustees set and monitor goals alongside the district’s superintendent, ultimately giving them the power to evaluate school performance. That’s huge! The body of 9 leaders get to determine how to measure success for 157,000 students and how to structure discussion at meetings in a manner that always leads back to this north star. Second – School board leaders in Dallas are entrusted with approving and managing a $1.8 billion budget. No, they are not handed a blank check and asked to allocate funds; but yes, trustees have presented plans and have the power to either give the go-ahead or block the expense. Third – school board leaders set policy under which the district’s schools are managed, arguably the most complex of the three responsibilities. This means each elected leader can take the initiative to revise or propose an idea to better serve students. An example may paint this picture best: It took the leadership of a trustee to propose free breakfast across all schools in a district where most families are considered “economically disadvantaged.” This was a new policy idea that revolutionized a students’ academic experience since the focus was now on their studies instead of an empty stomach. Judging by the magnitude of the responsibilities a school board possesses, it is critical that more people participate in the vetting of and voting of really great candidates. Understanding the role is half the battle. The other half is voting for leaders that are a good fit for the 3 major responsibilities a trustee fulfills. The Dallas Kids First team has at least 847 hours of observing board discussion and listening to board votes. Since 2012, the DKF team has been to every meeting: the monthly Board Briefing lasts an average of 7 hours (probably on a good night) and the monthly ‘voting’ meeting lasts an average of 4 hours. This investment of time and additional research by DKF has led us to identify research-based qualities that candidates and voters can use when considering leadership for school board. What qualities does Dallas Kids First recommend for school board leadership? Focus on student outcomes (“Kids First Mindset”) – As a Trustee, it can be overwhelming to vote on a variety of topics related to budget, facilities, course offerings, etc. DKF believes a school board trustee should ensure each decision ultimately addresses the question: How will this impact students and how can my vote best serve all kids across DISD? Education Knowledge – It is critical that a trustee fundamentally understand student challenges in Dallas ISD and have knowledge of successes from other districts, states, or countries to provide potential solutions locally. Leadership Experience – School board trustees need to have transferable, proven, and relevant organizational leadership skills that would add value to the board, especially as it relates to working with diverse populations. Understanding of Trustee Role – You just read how complex the role of a trustee can be. It is critical that a school board member has an understanding of the role with a clear anchor & focus on improving student outcomes. Urgency – A school board trustee must approach challenges with a sense of urgency, a sense of personal responsibility, and an action plan for improving students’ education journeys in Dallas ISD. 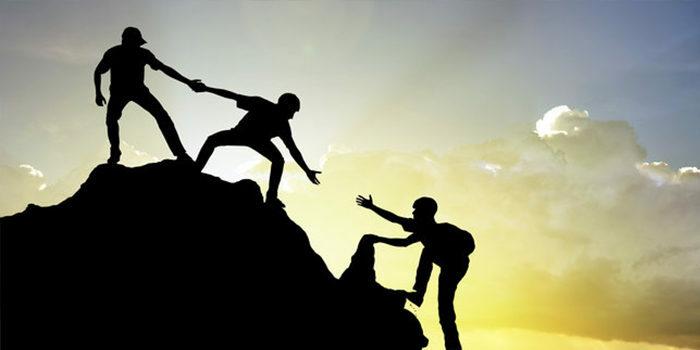 Community Partnership – A school board member must partner with the community on problem-solving and policy-setting towards improving student outcomes across the District. We invite you to lean into school board elections, just as our team has year after year. Our team initially started off with 4 neighbors volunteering time during elections to elevate expectations for school board leadership and has since evolved to empower community involvement on a year-round basis. The founding of the CAMP Fellowship (Campaign Activity and Management Program) under director John Hill has invited cohorts of 25 community members who represent the concerns & ideas of residents across Dallas and whom are all united by one common thread – a belief in making the city a better place through the education of kids in this city. The CAMP Fellows and growth of the DKF team have allowed us to address blind spots and evolve to pursue a positive impact. In the fellowship are teachers, Dallas ISD students, education non-profit staff, parents, and other leaders from a wide range of ages and experiences. The commitment to engage in the community with a minimum of 30 hours of community service and 100 hours of talking to voters has resulted in not just the success of outstanding school board leaders but acquired learning from the community and the CAMP Fellows on the importance of this leadership for kids, families, and neighborhoods. Election day is Saturday, May 4th– we hope when you make your mayoral choice and city council choice, you also consider a vote for standout school board leaders who have the potential to transform the lives of kids for the better. They’re just waiting for your vote. At a board briefing, our Dallas ISD School Board discusses items they will need to vote on in upcoming meetings. They also hear reports from the Superintendent & the Dallas ISD Administration on ways in which the district is meeting student needs. Below is a summary of the 10-hour briefing on March 7, 2019. English test takers in Kinder have 46% of students at Tier 1, compared to 45% last year. Spanish test takers at 62%, compared to 63% last year. English test takers in 1st grade have 44% of students at Tier 1, compared to 43% last year. Spanish test takers at 55%, compared to 57% last year. English test takers in 2nd grade have 53% of students at Tier 1, compared to 53% last year. Spanish test takers at 55%, compared to 58% last year. CLASS scores come from observation of behaviors in classroom. The better a classroom does on CLASS, the better the students do in achievement (as seen by ISIP). Looking ahead: continue focus on high-quality curriculum development; enhance and expand summer PD focused on new standards, continue rolling up new assessment (TX-KEA), and realign coaching support for classrooms with the highest need. Middle school grades are ‘make it or break it – students begin to disengage or leave DISD. There are indicators to know if a 6th grader is at higher risk of dropping out in high school – failing grade in Math or English, attendance rate of less than 85%, and unsatisfactory behavior mark in core course. Dallas ISD is proposing a Middle school Initiative which would strengthen the school experience for students and positively impact future success in high school and beyond. Criteria for being included in the M.S. Initiative: “Developing” and “Focus” campuses, low student achievement data, historical factors, percentage of proficient teachers, and equity demographics. 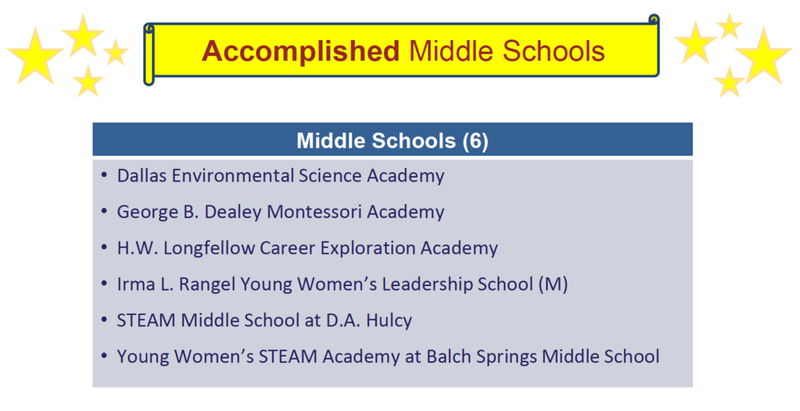 The Middle School Initiative would provide the following supports: strategic staffing, instructional excellence, social/emotional support, extended learning, and supportive partnerships. The structure would be a‘Teaming Approach’ - Break up school into small subsets of teams (ex: 6th grade team, 7th grade team, 8th grade team each have an assistant principal, a counselor, and 2-6 lead teachers under principal leadership. An exciting aspect of the initiative is that it would help close achievement gaps for African American students since 5,000+ out of 6,000+ African American students in 6-8th grade would be recipients of this investment. Superintendent Hinojosa mentioned that the cost of this initiative is $10 million. House Bill 3, if passed, could cover this cost. Dallas ISD administration proposed a Career & Technical Education Project which offers 22 credit hours for a certification. This would have a specific focus on construction, electrical technology, HVAC, and plumbing. Students in 9th grade would still attend classes at their home campus, 10th-12th grade students would be at a career institute for half a day 2x week and otherwise be at their home campus. This is different than P-TECH since PTECH offers 60 dual credit hours for a degree, this program offers a certification. The plan is to have four Career Institutes in each of the four quadrants of DISD. So far, two locations have been identified - north at Tom Field, south at Village Fair. Dallas ISD Administration presented two data sets: graduation rates for student groups and out-of-school suspension rates for student groups. Dallas ISD 2017 graduation rates of African-American, Hispanic, English Learner, and Economically Disadvantaged student groups exceeded statewide rates – students in Special Education lagged behind. The Office of Racial Equity stated that the next steps to address the graduation gap for students in Special Education would be to expand programs to keep students engaged in school and expand partnerships that connect students to work after graduation. For the suspension data, African-American students received referrals at a higher rate than other student group. Middle school grades had the highest suspension rates compared to other grade levels. Next steps for the Office of Racial Equity is providing Social-Emotional Learning (SEL) training for staff, identifying schools with highest referral rates, and giving more time at high-needs campuses to SEL coordinators. Over 18,000 applications to school choice options: collegiate academies, magnets, Transformation and Innovation schools (OTI). 1. Transformation Schools are brand new, open enrollment using priority lottery, no academic entry requirement, and transportation is provided to all DISD students. Innovation Schools are redesign/neighborhood schools, new instructional model, maintain existing attendance boundary, and maintain existing staff. Collegiate Academies: 87% internal applicants, 13% external applicants. 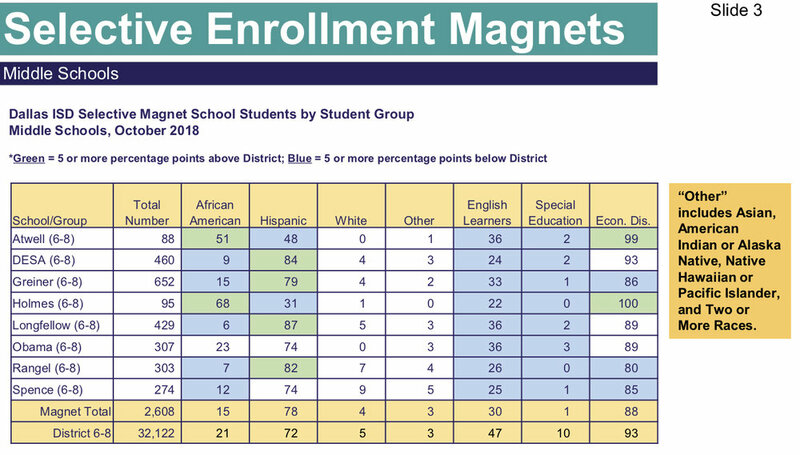 Magnet Schools: 68% internal applicants, 28% external applicants, 4% PreK applicants. OTI: 54% internal applicants, 23% external applicants, 23% PreK applicants. Ethnic demographics of applicants is similar to district demographics. Proposal for 6 new innovation schools: 5 personalized learning and 1 STEAM. These campuses would be across Districts 3, 6, 7, 8, and 9. This report shows implementation status of 16 recommendations on 5 key findings to support Special Education. Five findings include: clarity and direction in programming, equitable access to full continuum of services, staffing & organizational roles, systems of support to schools, and communication & engagement. Bright spots for status of implementing recommendations – evidence of progress for a core academic plan providing direction and programming, a “Does Not Qualify” review process, and bilingual leadership for Sp. Ed. Needs work for implementation: staffing and organization for the ARD Facilitation & case management. Takeaways: access and outcomes have improved, teachers and principals support efforts underway and seek continued improvement, and parents are appreciative of this focus but desire better communication, customer service, and opportunities to engage in decision-making. Marshall: Need to step up in this area. Want a new position for ARD and case management. Foreman: Want to know how much money we get before we increase budget for Special Education. Micciche: Want to ensure schools that have the Special Education Unit are also meeting needs elsewhere. This presentation is an update on the process used to select K-8 Reading & Language Arts instructional materials for 2019-2020, aligned to new TEKS, and designed to last for 10 years with digital & print resources. The new standards call for authentic integration of reading and writing and a focus on foundational learning (i.e., phonics). The Dallas ISD administration is asking the board to approve resources to support this transition. Admin has had ‘roadshow’ for campus recommendations. Teachers have voted on the preferred resources and now admin must plan for implementing. Attending DKF’s community endorsement interview felt like such a critical opportunity for me as a passionate advocate for community and education. It was an eye-opening experience as my first time meeting candidates, even though I attended DISD for 10 years as a student and later worked for 5 years as an educator in two elementary schools. I was joined by a diverse group of parents, fellow educators, non-profit representatives, business owners, and students, too, all just as fiercely passionate about holding our district accountable for improving opportunity for all students across the district. Being front row, listening to and asking questions of candidates made me feel the weight of electing a well-qualified representative for trustee in a newfound, guttural part of my conscious. It was the feeling of my intuitive alarms going off, creating emotions of empowerment and frustration at the same time. I was genuinely grateful and enthused to see individuals outside of my own tight-knit progressive community seeking the same change and betterment for our kids. Yet, after several questions around my district's candidates and their backgrounds, I realized there must be obstacles keeping other experienced and qualified individuals from pursuing election as well — an issue I know is more complex than this reflection allows. After participating in the experience, I explored my own questions around metrics for school and district performance, policy-making and access to our elected representatives. Having seen my own family and friends become lost in a system and lose out on educational opportunities, I have deep personal connections to seeing the educational landscape in my hometown improve. I look forward to using my experience to share my perspectives while canvassing, at discussions with colleagues and organizational partners, and helping all people across the city realize not only do students and families have a lot riding on these elections, but we all have skin in the game, and our votes are our play calls. Nancy Tien is in the CAMP Fellowship. She is an educator with five years of experience as a teacher leader in Dallas and Mesquite schools. After college, Tien, a Dallas ISD student, returned to the district as a 2013 Teach for America corps member. Throughout her years as a teacher, Tien volunteered on several campaigns to support candidates who put education at the forefront. She also worked to promote policy changes at the local school level to impact Dallas students. 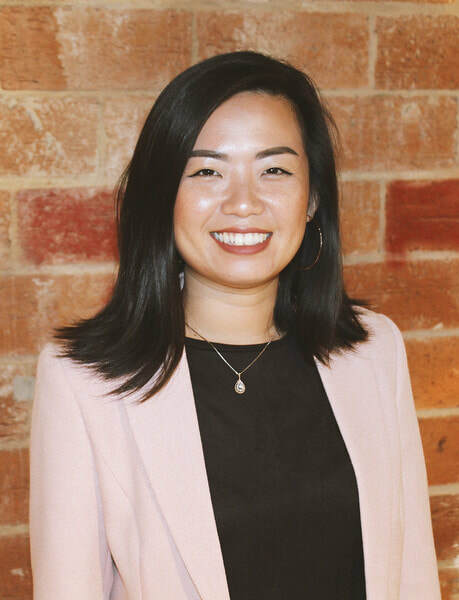 In the past year, Tien served as a Racial Justice Fellow with Teach for America, designing and facilitating group learning around identity work for Asian American, Native Hawaiian, Pacific Islander, Middle Eastern, North African, South Asian (AANHPI/MENASA) corps members. Tien continues her work for educational equity through continuing to volunteer and organize for campaigns and is currently planning to attend law school to further her efforts. At a board briefing, our Dallas ISD School Board discusses items they will need to vote on in upcoming meetings. They also hear reports from the Superintendent & the Dallas ISD Administration on ways in which the district is meeting student needs. Below is a summary of the 6-hour briefing on February 14, 2019. WHAT DID THE BOARD DISCUSS AT THE JANUARY BRIEFING? Admin proposes 10 current PreK Partners to DISD operate under SB 1882 parameters. First five partners to consider for approval: Bryan’s House, Child Care Group, Good Street Learning Center, Heavenly Learning Center, and Mi Escuelita. Stays same under current SB 1882 Partnership: DISD Teachers, DISD Students, Partner site. Partner could refuse teacher placement. Teacher would still remain DISD employee. Curriculum could be different if the partner chose to make a change. Partner will report student performance metrics to DISD/Board for accountability. Additional funds. DISD would receive funds from State, DISD would keep 10% of those funds and distribute 90% of those funds to partners. Trustee Foreman: Can this policy change to include other types of partnerships outside of PreK? Only PreK now. Worried about PreK students matriculating outside of DISD for Kindergarten. Pinkerton: Concerned about representation of who is in control at partner site. Blackburn: Is money only difference? Funding is a great advantage for improving care for kids over time. Henry: What determines the 90%-10% split of funds? How does the district manage relationships with partner? 90-10% split is based on a different partnership model we have now. Contract will determine district’s relationship with partner. Marshall: Benefits to PreK programs? Students in DISD PreK outperform those who are not in DISD PreK, improvement in quality of education, access to quality PreK where there otherwise may not have been, and improving enrollment. Takeaways: Students and staff surpassed goal progress measures for both goals 1 and 3. However, growth for all students compared to growth for African American students still has a gap – it is something the district is working to address. Marshall: Let’s set higher goals! Proud of progress. Henry: Thank you for focusing on African-American population. Superintendent Hinojosa shared an update on public school finance. At the state level, Public School Finance is now an “emergency item,” meaning that legislation can be passed within the first 60 days of the session. Bills focused on school finance should be filed within the next 10 days (before end of February). Ideas being discussed for bills include: Increase basic allotment; Recapture funds being spent on public education; Fully funding PreK; Funds for strategic compensation. Marshall: Thank you for advocating for better funding on behalf of DISD and TX students. Micciche: Concerned about tax cap and funding schools. The board had to complete a self-evaluation and sign off they are not engaged in day to day administrative and operational issues. The question brought for discussion was: Should Trustee appointments be residents from Trustee’s single-member district? Officer may be removed from office by vote of a majority of the board. – as opposed to super majority. Board shall approve committees as the board may deem necessary. Standing committees shall include, Audit Committee, Superintendent’s Evaluation Committee, and Policy Chair. Solis: Policy doesn’t clearly state who has the power to create committees. I would propose giving the president power to vote, alongside other board members, when in a committee. Marshall, Solis: Agree with changing from 6 to 5 board member approval for removing trustee from office. At a board briefing, our Dallas ISD School Board discusses items they will need to vote on in upcoming meetings. They also hear reports from the Superintendent & the Dallas ISD Administration on ways in which the district is meeting student needs. Below is a summary of the 8-hour briefing in January. The Texas Public School Finance Commission members unanimously agreed on 34 recommendations for the legislature. This unanimous agreement does not mean the legislature will necessarily approve all 34 recommendations. Their report does not have specific funds tied to each recommendations at this point in time. Dallas ISD Consultant recommends that the DISD School Board take a position on which recommendations to advocate. Trustee Marshall: Need a game plan for taking action. Would like more detail for each recommendation. Trustee Henry: Don’t want to wait, there’s nothing more pressing for a school board member than what happens with public school finance. Superintendent Hinojosa stated that the current policy would not include partnerships with charter schools. Trustee Foreman: How will funds be distributed? Funding goes directly to schools and the performance contract would determine how the money would be used. Does Dallas ISD continue to supply technology, sports, field trips, etc.? Yes. Can Dallas ISD use the internal audit? Yes, we would recommend that. Trustee Pinkerton: Want to ensure there is intention to make partnerships with organizations that have experience improving student outcomes. Want safeguards for including community members, educators, and families in the process early on. Trustee Marshall: Would want there to be a vote on each partnership agreement for each campus - not across more than one school campus. And, can you give an example of a difference in the day of an employee at a partner campus vs. a non-partner campus? Example - school calendar could look a bit different. The administration presented progress towards meeting district goal 4, which states: “Student extracurricular or co-curricular participation will increase from 59% to 78% by 2021-2022. Elementary school participation is at 79.2%; its goal is to reach 82% by 2021-2022. Middle school participation is at 75.8%; its goal is to reach 76.6% by 2021-2022. High school participation is at 68.4%; its goal is to reach 71.6% by 2021-2022. The administration shared information regarding its offerings for students. At high schools, boys and girls each have 10 options for sports. In middle schools, boys and girls each have 6 options for sports. Currently, the administration is working to better utilize UIL-allowed athletic periods, fill all available coaching slots with qualified teachers & coaches, improve summer strength and conditioning programs, and identify funds to begin training 3rd-6th grade students. Next steps will be to standardize athletics as a part of the master schedule students have. Trustee Foreman and Micciche: Nurturing the whole child is important; sports gives students another way to learn. Teachers felt intervention system was complicated. Now, DISD will use a different management system called ‘Power School’ which has already led to fewer teachers reaching out with troubleshooting. Parents and teachers were confused on pre-referral supports. Now, DISD has monthly meetings to review data and clarify the intervention process for all relevant parties. Trustee Foreman: How have teachers weighed in? Teachers and counselors shared input through Planning Committee Sessions and through curriculum feedback survey. In addition, each campus has a representative for this system. Trustee Pinkerton: How many students have we identified as needing support? 13,000 students. Trustee Flores: Does this support allow us to identify student needs earlier? Screening process should help. This presentation was designed to bring context to upcoming contracts as the district team rolls out its 3-year technology implementation plan. The district has already completed a Wi-fi assessment, digital curriculum, implementation of Power School student information system, and delivered professional development to use technology tools and infrastructure effectively. The district is in the midst of deploying devices to campuses, updating IT policies & procedures, and approving contracts for additional planning. Trustee Foreman: Is there a plan to replace devices over time? Yes, built out a 10 year plan. Trustee Pinkerton: Is the money for these efforts from the 2015 bond? Primarily but not exclusively. Would like to know how much more money is needed for the remainder of the implementation plan. Trustee Blackburn: How does the one-to-one device ratio work? Core classrooms will receive a set of devices so that each student in the classroom has access to a device. This means that as students rotate through their class schedule and visit core classes, they will have access to a device. There is not a TAG facility in Districts 5 or 6 in Southern Dallas. Providing talented & gifted programming would aim to provide equitable opportunities for students living in these districts. First proposal is to have a Grades 1-8 TAG at Mills. In Fall of 2019, Mills would start with grades 1-6. Students who are currently at Mills and do not qualify for the TAG would have the benefit of staying on the campus. Moving forward, any student currently zoned to attend Mills would now be rezoned to attend Cedar Crest. Second proposal is to have a Grades 1-5 TAG at Mark Twain. Same as Mills, students who are currently at Twain and do not qualify for the TAG would have the benefit of staying on the campus. Moving forward, any student currently zoned to attend Mark Twain would be rezoned to either Carpenter or Turner. Trustee Marshall: Great news. Why grades 1-5 at Twain? Space and it is a model that other districts have seen to be successful. Trustee Blackburn: Concerned about transportation of students who would have to walk. Please make sure the routes are safe or transportation is accessible. Trustee Henry: Want to make sure that the new TAGs in the Southern sector don’t take away from resolving the underrepresentation of student groups or other issues that need attention in existing TAG’s across the district. Is the board president within their right to appoint themselves to the audit committee? Is the board president within their right to select an attorney for legal matters without consulting the board? Is the board president within their right to deny a trustee access to counsel? The board lawyer was not available but the district lawyer answered that from what is available to her in policy, the board president is within their right on all of the items stated above. Trustee Pinkerton: Want to make sure there is a system of checks & balances. There was not a presentation from the administration; however, the powerpoint slides were posted describing the intent of the recruitment incentives. These incentives are aimed at attracting candidates to secondary math, secondary science, career & technology, special education, and elementary bilingual. Trustee Marshall: Every year I worry and share the feedback that we should be increasing overall salaries for teachers who are teaching in these high-need courses rather than using a recruitment incentive that could very well result in the teacher leaving after they receive the incentive. Trustee Foreman: Want to see which teachers we retain from this incentive program. At a board briefing, our Dallas ISD School Board discusses items they will need to vote on in upcoming meetings. They also hear reports from the Superintendent & the Dallas ISD Administration on ways in which the district is meeting student needs. Below is a summary of the 8-hour briefing on November 29, 2018. WHAT DID THE BOARD DISCUSS AT THE DECEMBER BRIEFING? PreK continues to produce meaningful results in transition from ISIP to new K-ready assessment: TX-KEA. The TX-KEA assessment measures: Language, Literacy, STEM, Social Emotional, Executive Function, + Academic Motor Skills. ISIP will continue to be the progress monitor tool in the meantime (during the transition). Goes beyond just a literacy focus compared to what district has used in past. TX-KEA mirrors assessments students will see in 1stgrade and beyond. Teacher and student work together 1:1 through questions, giving teacher info in multiple ways. ISIP is norm-referenced where KEA is criterion-referenced (like STAAR). Sept. 2018 results show 70% students on track. Students in DISD PreK outperforming those not in DISD PreK (but eligible) by 39 percentage points. 42% of students who took both ISIP and KEA are on track according to both ISIP and KEA, 28% not. 4% of students on track according to ISIP but not KEA; 25% on track according to KEA but not ISIP. Looking ahead: Continue K-12 curriculum development, prepare for new 2019-2010 TEKS, roll up TK-KEA will one year at a time with each class of students, expand PreK3 and PreK4, + focus on coaching quality. Trustee Foreman: Comparison of students calls ineligible PreK students ‘affluent’ though they may be ineglibile for different reasons (i.e., parent in the military) – needs clarification. Good point. How long is the assessment? Time is spread out over multiple days. Trustee Pinkerton: Exciting to see 1:1 testing for more accuracy. Any other assessments to measure skills that may not be included? Yes, as an example: running records for reading. PreK enrollment? 3,400 PreK3, 9,600 PreK4. Trustee Marshall: How are we testing social-emotional component? Teacher completes checklist over 4-6-week observation. Concern on norming teachers for assessing students. We have and will continue to train teachers, and more importantly, to use information afterwards. Trustee Henry: What does the assessment look like over time? District gave suggestion of timeline. Teacher uses technology to scroll through questions and the student verbally shares response. What feedback do students get? Teacher can suggest activities for home practice with parents.When is assessment completed? This year, only required once a year - September. Does this assessment allow for comparison outside of TX?No, only TX districts. Does only one teacher provide feedback? Yes. The Dallas Education Foundation: 501C3 nonprofit designed to raise philanthropic funds for district. invites community to be a part of solution. Where the district is: Wants the foundation to be integrated with DISD, foundation must reinstate its 501C3 status and its governance structure. District has created a Memorandum of Understanding to protect DISD by approving the support for DEF & itemizing the commitment from the district and from the foundation. Next steps: Re-launch the foundation, confirm the board of directors, launch an ED search, identify funding priorities, and develop a plan of work. Ultimately, need approval of MOU. Trustee Marshall: Fully supportive. Elaborate on part-time ED? Part DEF, part district-employee = full time position. Please plan for growth of DEF team; need ED with deep relationships in business & philanthropy network. Trustee Foreman: Historical perspective – experienced challenges. Don’t see goals, timelines, etc. How to hold DEF accountable? There is a strategic plan in place, we can share & make more specific. Can you share past disbursement of funds? Yes. Difference between Volunteer Partnerships and DEF? DEF is focused on corporate donations; VP is focused on specific needs (washer/dryer, etc.). Trustee Solis: Let’s get it right this time. Understand tension between having goals and having someone (ED) to create goals. Suggestion – let’s shorten the 3-yr plan to a 1-yr plan, then build out if we trust the work. Trustee Pinkerton: Appreciate generosity of Dallas philanthropy. Agree, let’s get it right this time. Are we in good standing to launch? Yes – all corporate documents filed. Can we cap administrative spending if the DEF team were to grow? Can discuss and get board approval. Agree with Solis about 1-yr plan. Trustee Henry: Agree on 1-yr period. Agree on exceptional talent for ED hire. ED should have strategic plan on goals, though MOU could include some measurements before the hire. Trustee Blackburn: I’d like copies of past by-laws to ensure we get it right. Would like reports to share periodically with board. There is a retroactive payment from 2016 in the MOU? – Let’s take that out if possible. Trustee Micciche: Let’s take a real hard look at why DEF has not succeeded in the past. Using the data from the Long Range Master Plan and the corresponding proposal from the Strategic Facilities Plan Version 1.1, district has detailed its recommendations for Phase 3 of the 2015 Bond. For Long Range Master plan, needed $1.6B to complete projects, specifically when looking at priorities 1 and 2. Priorities 1: critical replacements of equipment & systems with 0-2 years left of utility. Priorities 2: replacements of equipment & systems with 3-5 years left of utility. In Phases 3-5 of Bond program, there were 121 projects identified. We have funding for $450M for these phases. Would need additional $1B to target priorities 1 and 2 for those 121 projects. Facilities Condition index (FCI) Schools Ranking: highest (worst condition) to lowest (best condition). Concentrate remaining dollars to schools that have not had any work done to them. Address high schools as quickly as we can – recommend moving all high school projects forward. Any building that exceeds 300 students, would be considered a part of phase 3 (if available funds). Won’t put money into schools that need to be replaced in the future. Maximum of 4 schools per district for each of the 9 districts. Ultimately selected 3 for each district. Admin recommends 27 schools for phase 3 of bond program: Rosemont, North Dallas, Pershing, Gooch, De Zavala, Webster, N. Adams, B. Adams, Madison, Gill, Chapel Hill, Casa View, Donald, Carr, Silberstein, Hill, Holland, Martinez, Lanier, Jordan, Anderson, Central, Bonham Solar Prep, Mt. Auburn, Pinkston, Sunset, Rogers. The 27 schools total $440M. We would have a $10M buffer. Admin reduced bond program to 3 phases (originally it was 5) to address school needs more quickly. Hope for future bond program that allows district to move all schools up to standard. Following through with these recommendations allows: all high schools in great shape, makeover at several schools in every part of town, and shows taxpayers what our schools could look like for a future bond. Pinkerton: Concerns about Rosemont and its lower price tag. How do we tackle critical needs at other schools not on the list of recommended projects? We will utilize the maintenance department. Trustee Marshall: The data we used for the 2015 bond compared to the facilities assessment data we received in the last year has resulted in a different prioritization of campus needs. We can’t get bogged down on different approach for a single school, need to stay macro so that we can prioritize across district. Trustee Foreman: Some schools repeatedly receive bond money. Let’s make sure we are equitable. Trustee Solis: Martinez has grown, what does support look like? Listed with priority 3 items (i.e., expand library). Trustee Blackburn: Please consider growth in West Dallas when planning for Pinkston (Carr and De Zavala, too). Trustee Resendez: Please get FCI score for Pleasant Grove TAG School. That is a concern. Office of Racial Equity has chosen 3 areas of focus for quantitative data share: student access to schools of choice, enrollment of African American students, and student achievement on Advanced Placement exams. Admin presented a slide that demonstrated, on average, African American enrollment in the district has remained at a steady 22/23% of total district enrollment since 2014. Trustee Henry: I see huge inequities. We have to start acting on this. This isn’t an issue just for DISD, but across the nation. I believe DISD can lead the way on this. ForeTrustee man: It all comes back to access, and for me, it’s by design. Trustee Solis: The data are what the data are. We need to see this, and we should not be afraid of being bold. Trustee Pinkerton: Nothing new to add considering my colleagues’ statements. Trustee Micciche: We are all behind this and have been behind equity from the beginning of this process. This agreement allows district to partner with other entities through SB1882 (higher ed institutions, non-profit organizations, or governmental entities). The schools and students that are a part of the partnership would still be DISD students and schools. This policy is required for the district to participate in partnerships. It is also a TASB recommendation, and the district’s legal department has made edits. There are also some non-negotiables – governing body would have purview of curriculum – but the district can negotiate this as it seeks partnerships. Academic and financial goals are also decided on by this governing board. Trustee Foreman: This reminds me of the home-rule charter, where partnership board takes away from the DISD School Board’s role. Concerned about who makes up the application review committee. 10-yr contracts with partners? Upto 10 yrs for the partner, but required 10-yr for in-district campus. Trustee Pinkerton: Why this need? DISD has made progress; partnerships enhance opportunities + resources for schools. Partnership would also have to be very unique and exciting before we consider partnership. Do we have any partners in mind? Yes, some ideas. DISD’s role? Details in performance contract would outline those specifics. Policy approval allows district to have partnership option – does not obligate it. Please run analysis on additional funding per student + consider board input for the application committee. Trustee Marshall: Before we sign off, want to understand who is in charge of what (i.e., Who hires teachers?). We will share a sample of an agreement. If DISD is doing well, want to be careful proceeding forward by relinquishing authority. Let’s see what proposals bring us, we have plenty of schools in need. Trustee Blackburn: Who pays for these partnerships? TEA gets final approval after DISD School Board approves. Trustee Henry: Can school board identify someone to be on the governing board? Yes. What other examples of responsibility can you share on the partner side? Partner could get final say on DISD employee hire at the campus. Shortest agreement? 3 yr. Primary concern - governance. Trustee Micciche: What do we mean by charter? In-district charter, someone with whom we enter into agreement. Don’t want anyone to get impression we are turning our schools over to competitors at charter schools. Trustee Pinkerton: Example of partnerships with governmental entities?City partnered with San Antonio ISD to support Pre-K.
For full video clips of board discussion or for a closer review of each agenda item. please visit the Board Docs site with all public materials. Questions about this summary? Email info@dallaskidsfirst.org. At a board briefing, our Dallas ISD School Board discusses items they will need to vote on in upcoming meetings. They also hear reports from the Superintendent & the Dallas ISD Administration on ways in which the district is meeting student needs. Below is a summary of the three-hour long briefing on November 1, 2018. WHAT DID THE BOARD DISCUSS AT THE NOVEMBER BRIEFING? Board discussion included questions from a few board members (Marshall, Blackburn) on why the new LAS score is needed and concerns on the way in which it may confuse parents & community members when they see two different school scores. Pinkerton and Henry asked about the implications of the district having lower scores for schools compared to the state and the administration responded that the LAS was once an internal measure that raised the expectations for achievement across schools, which accounts for the difference. Resendez asked about the possibility of continuing to keep LAS as an internal measure so that the district doesn’t confuse the community with multiple scores. The administration said it is a consideration. 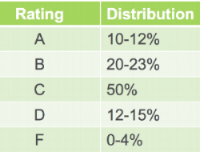 Across campuses, the district will distribute scores using the following distribution in its first year. After the first year, campuses will not be ‘forced’ into a rating, they will have the ability to move from one rating to another depending on performance from each domain. The Long Range Facilities Plan that the district uses functions as a database which shares assessments of schools, utilization, condition of facilities, etc; whereas, the Strategic Facilities Plan is a more dynamic plan that changes as the district plans to modify existing schools to meet needs of the district. 17 new campuses: Hawthorne, Peabody, Hall, Rhoads, Kiest, Geneva Heights, DeGolyer, Hexter, Reilly, Walnut Hill, Urban Park, Pease, Atwell, JQ Adams, Longfellow, Marcus, DESA. Board discussion included comments from Trustee Solis asking the administration to thoughtfully consider demographic changes in neighborhoods as well as racial equity when generating plans. In addition, many trustees thanked the administration for bringing this plan to replace an earlier version that raised many concerns across the district. The Superintendent has a Principal Group whose purpose is to get feedback from some of the highest-performing principals in the district and to give them the opportunity to connect and learn from one another. Selection of the principals is considerate of academic success on their campus and diversity of members in regards to race, gender, and school experience. There were three principal participants present to share the takeaways from their experience. They agreed that a great benefit was learning from one another and staying current on the work & role of the Superintendent and his team. Board discussion included a comment from Trustee Pinkerton asking for opportunities like this to be available to others. Trustee Henry asked how the board members could best support principals. In response, the principals shared that trustees should walk a school with them to gain perspective. They also responded that they would like the board to ensure there isn’t a disconnect between the schools and the community. Trustees Solis and Micciche asked about their experience - all three principals began their journey as educators through non-traditional programs and all three principals have a shared vision of focus on students. The administration began this part of the agenda with a note on two items worth celebrating: 20% of schools on the Improvement Required list (lowest state rating for a school) has gone down to 1% in just four years. Plus, the district is closing the gap between the state’s average performance and the district’s average performance. In relation to TEI, the evaluation and compensation system for teachers, there are three components: teacher performance from observations, student experience as determined by surveys, and student achievement on state/district assessments. Using this rating system, teachers receive a performance level of: Unsatisfactory, Progressing, Proficient, Exemplary, or Master. Because this system is also about compensation, the administration pointed out that 97% of teachers received a pay increase. Only 3% of returning teachers did not. Overall average increase in salary was 2.9% compared to the market average of 2%. Board discussion included a question from Trustee Foreman on how many teachers in the district are not evaluated under TEI - the response was a little over 250 out of 10,000. She also wanted to ask that all teachers have a student experience survey included in their rating. Trustee asked if with more funds the administration about the possibility of changing the forced distribution ratings of TEI to ensure more teachers are reaching proficiency levels or above. The administration responded that it is possible. Trustee Blackburn asked about how the district defines ‘an excellent teacher for all’ - and the administration replied that it would be a teacher with a rating of proficient or higher in every class and equitable distribution of higher-rated teachers for highest-need students. Trustee Resendez advocated for ensuring we support our teachers to receive a proficiency level or higher - despite cost implications - even with potential cost for paying higher-rated teachers - the list cost savings are immeasurable. The board has a Governance Committee whose focus is to review the board’s operating procedures, onboarding training, and board policy. Trustees Henry, Solis, and Resendez and shared some documents with the other board members during this briefing, though there was no public discussion. In addition, the board and administration did not discuss the board self-constraint or self-evaluation. Student achievement on state assessments in all subjects in Domain 1 will increase from 39 to 47. Student achievement on the third- grade state assessment in reading at the Meets performance level or above shall increase from 32.5% to 45.0%. Student extracurricular or co- curricular participation will increase from 59.0% to 78.0%. Purpose of adult education classes is to remove language barriers for parents. These classes will encourage parents to engage in their kids’ campus experience by eliminating the language barrier. At a board briefing, our Dallas ISD School Board discusses items they will need to vote on in upcoming meetings. They also hear reports from the Superintendent & the Dallas ISD Administration on ways in which the district is meeting student needs. Below is a summary of the three-hour long briefing on October 4th, 2018. WHAT DID THE BOARD DISCUSS AT THE OCTOBER BRIEFING? The data highlighted a difference of 43% of students who attended Dallas ISD PreK at ‘meeting’ standard compared to 35% of students ‘meeting’ state standard who did not attend Dallas ISD PreK. The data also shows that the district is performing higher than the state’s overall average. The district team will continue to build in benefits for students in the early grades to support them leading up to 3rd grade. Dallas ISD not only is leading in year-over-year growth in 3rd grade reading, it is one of two districts that experienced growth. This trend is similar when looking specifically at African-American students and Hispanic students. Right now, the board has a goal of 40% of all students to be at Meets level – 46% of Hispanic students are at ‘Meets’ level. This population of students is exceeding this goal. We should see this continue to improve. The trustees shared their pride in the growth and progress for students served in the district under the administration’s leadership. Trustee Solis wondered about a comparison to other districts who have invested in early childhood both within the state and beyond. Dallas ISD is finalizing a legislative program to advocate at the state level in support of local district goals and needs. During the meeting, the board and district leadership team narrowed down their focus to a clear top three priorities. Because the midterm elections may bring about some changes, a meeting to finalize the legislative priorities will occur after November 6th where the district will meet with the Dallas delegation of legislators. The top three priorities include: 1) Recapture funds to be spent on education. 2) Increase the basic allotment per student. 3) Full funding for universal PreK. Discussion from the board included comments from Trustees Foreman and Flores asking for Universal Pre-K to be inclusive of all four year olds. Two district leadership teams worked alongside 84 teachers to write curriculum for Reading, Language Arts, and Social Studies. Over 600 teachers applied to participate in this effort and 84 ultimately contributed energy and resources towards finalizing unit plans for teachers. In terms of Math and Science. the district is still in the process of onboarding curriculum writers and will launch the curriculum next year. Outline of TEKS to be taught in each six weeks with focus on weaknesses to address student needs. Professional Learning Community package to be used during common planning: unpacked TEKS, exemplar lessons, etc. Preview of the six weeks at a glance to train teachers prior to implementing six weeks unit plans. The curriculum includes differentiated instructional ideas for various groups of students - special education, talented and gifted, English language learners, and others. In addition, the leadership team is collecting video to demonstrate the curriculum in action as an example and will continue to visit classrooms to collect feedback on implementation of the curriculum. Currently, there is an effort to raise awareness that the curriculum exists at all for teachers around the district. Board discussion included questions from Trustee Foreman on the selection of the teachers, to which the district shared there was an extensive vetting process that narrowed the field of 600+ teachers to 84 final curriculum writers. Trustee Foreman also raised concerns around flexibility for teachers who are using this curriculum - the administration shared that the curriculum should function more as a guide and resource than as a lesson script. Trustee Resendez wanted to ensure social-emotional learning was embedded in the curriculum and the presenters shared that it was built in. Trustee Pinkerton asked about how far in advance the teachers would have the curriculum available and the answer was at least six weeks. Overall, the board was grateful for this resource. The board took a moment from the briefing to sign off that they “shall not assume a supervisory role with staff or students.” Each month the board signs off on a different statement for self-evaluation, prompting Trustee Foreman to request an overview of the time required to spend on these periodic self-evaluations through the Lone Star Governance integrity instrument from Texas Education Agency. The final item on the agenda relating to student outcomes was about the Texas Education Agency Virtual Schools Network and their offering of 90+ high school, AP, and dual credit online courses. Texas code says these courses must be offered and students must be informed of their availability. One comment from Trustee Foreman was about getting clarification on how attendance is configured for online participation and what the role of the school staff is when managing these courses. At a board briefing, our Dallas ISD Board discusses items they will need to vote on in upcoming meetings. They also hear reports from the Superintendent & the Dallas ISD Administration on ways in which the district is meeting student needs. Below is a summary of the seven-hour long briefing on September 13th, 2018. WHAT DID THE BOARD DISCUSS AT THE SEPTEMBER BRIEFING? The district has set four student outcome goals. The administration presented on progress for one of those goals. Goal #2 - Student achievement on the third-grade state assessment in reading at “Approaches” or above will increase from 62% to 75% by 2022. 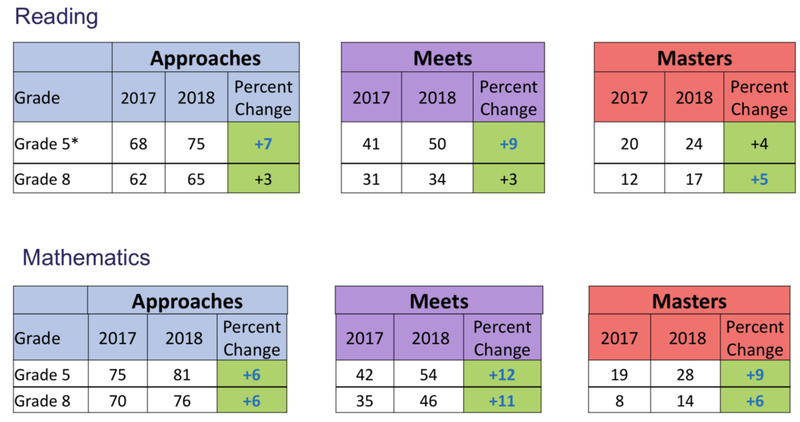 Data from student assessments in Kindergarten, 1st grade, and 2nd grade show growth in all grades from 2016-2017 to 2017-2018. Below are the results from the ISIP assessment, showing results from the beginning of the year (BOY) compared to the end of the year (EOY). The board’s response to the presentation included questions and comments from Trustees Marshall, Henry, and Blackburn asking how the success from Harlee could be replicated across more district schools. The P-TECH program is a collaboration between a DISD high school, a college, and an industry partner. Across the state of Texas, Dallas ISD holds more than half of all the state designated P-TECH schools (18). Dallas ISD Administration reported that these early college P-TECH programs have a high retention rate compared to students who are not in the collegiate academies. In terms of ethnic makeup, the student population is also comparable to students who are not in the collegiate academies. 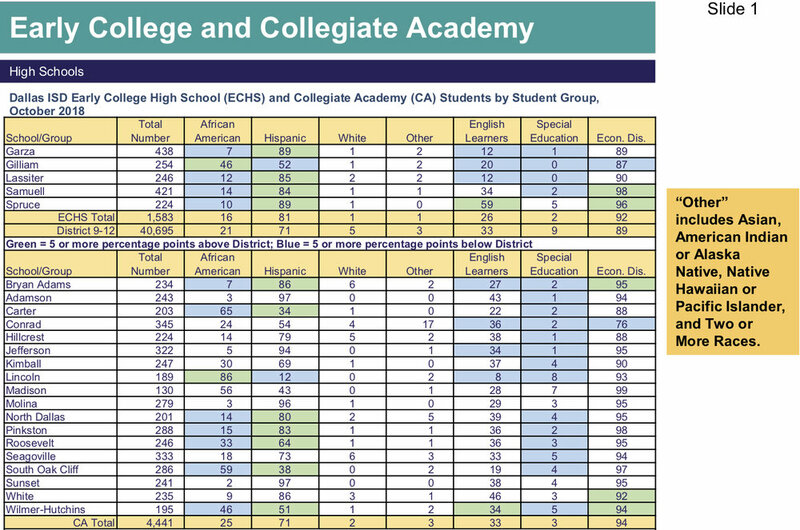 Below are some data points the DISD Administration reported from two program years of P-TECH (Cohort 1 and Cohort 2) and compared it to students that are not in the collegiate academies as well as to the state average. Board discussion included comments from Trustee Foreman asking for the opportunities of the collegiate academies to be expanded to more high schools & students. Attract: Define leadership competencies, identify high-potential candidates, provide incentives for continuing education, and provide communication for outreach between leadership stakeholders. Prepare: Provide internal professional development and establish distributive leadership models. Develop: Build and leverage external partnerships for principal development, support the executive directors (who work with principals), and offer districtwide leadership professional development sessions. Retention: Recognize outstanding leaders, offer choices for professional development, grant earned autonomies, strengthen a feedback loop for improved effectiveness, and continue supporting schools with Funds for Racial Equity (FARE). Board discussion included comments from Trustee Marshall who wanted to ensure we ‘thought big’ when it came to leveraging principal development, as it has great potential to drive improvement. Standards of Service - All schools should receive consistent standards of service. Managed Instruction - All schools should have a managed foundation that comes from state laws and DISD leadership. School Performance Ratings - Every year, schools are rated with the School Performance Framework. Flexibility and Empowerment: Based on ratings, schools earn autonomies. The ratings come from the School Performance Framework, which highlights that growth matters, not just state distinctions. Board discussion included a comment from Trustee Pinkerton in ensuring that the Standards of Service (as they currently stand in the Theory of Action & School Performance Framework resources) are measurable and SMART (Specific, Measurable, Achievable, Realistic, Time-bound). There was no board discussion as the board signed the documentation. The University of Pittsburgh Institute for Learning is providing professional learning and support to 12 DISD secondary schools serving predominantly African American, Latino, English Learner, and low-income students. The purpose would be to partner with schools to problem solve and support student achievement (with attention to literacy). Board discussion included comments from Trustee Henry to consider adding a South Dallas school to the list of chosen campuses. Student participation in extra-curricular or co-curricular activities will increase from 59 percent to 65 percent by 2022. Student achievement on state assessments in all subjects in Domain 1* will increase from 39% (2016-2017) to 47%. Student achievement on the 3rdgrade state assessment in Reading at the Meets* level or above shall increase from 32.5% (2015-2016) to 45%. Board discussion from trustees indicated the need for more time to digest and process the goals prior to sharing more feedback. The Dallas ISD Administration will hold a public hearing on September, 27th to discuss and review improvement plans for Pease, Holmes, Atwell, and Patton. August Board Briefing: First Meeting of the Year! At a board briefing, our Dallas ISD Board discusses items they will need to vote on in upcoming meetings. They also hear reports from the Superintendent & the Dallas ISD Administration on ways in which the district is meeting student needs. Below is a summary of the nine-hour long briefing on August 9th, 2018. WHAT DID THE BOARD DISCUSS AT THE AUGUST BRIEFING? The district has set four student outcome goals. The administration presented on progress for two of those goals. Goal #1 - Student achievement on state assessments in all subjects at "Approaches" or above will increase to 75% by 2022. Goal #3 - Student achievement on state assessments in two or more subjects at "Meets" or above will increase from 34% by 2022. 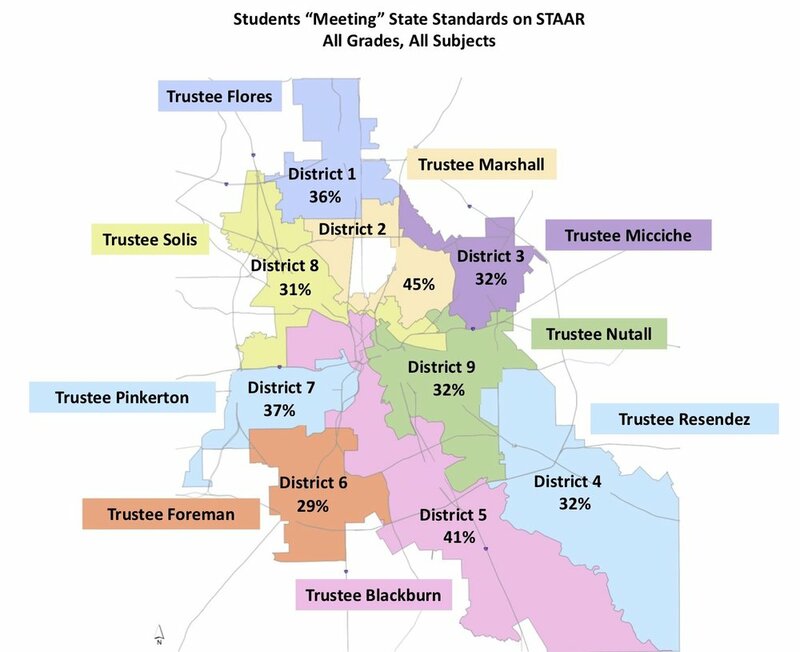 The reports presented on student achievement for 2018 indicate that our students, teachers, support staff, and leadership teams have made gains that exceed the state average in almost all categories for grades 3-8 on STAAR assessments. In addition, the district presented the A-F Accountability system which gives the district a letter grade (campuses will also receive letter grades). This grade is a combination of student achievement, student progress, and closing gaps for our student populations. In response to the presentation from the administration, Trustee Foreman presented a concern in regards to the gap between the state's absolute achievement compared to Dallas ISD. She made the point that while we are looking at data that indicates great gains, we are still lagging behind the state's average achievement results. Trustee Henry raised concerns about supporting our African-American student population as it currently shows that this student group's data is lower than other student groups. Trustee Resendez focused his comments on the cause behind the positive results - the Superintendent shared that it is a result of collective work, setting student outcome goals, and the ACE initiative. Finally, Trustee Marshall asked about the letter grade the district will receive and how we 'get points' for closing gaps for each student group the district serves. Dallas ISD student achievement results have created an opportunity to build in a FARE proposal to support racial equity strategic initiatives. At the briefing, 19 schools were included in a preliminary list for receiving additional support from FARE. This list will be modified once the state shares final data from state assessments. Board discussion include comments from Trustee Marshall on the comparatively low amount of FARE funds when looking at previous proposals. Superintendent Hinojosa shared that the lower amount is a result of overall improved performance in the district and therefore fewer 'fragile' schools in need of these funds. Trustees Solis and Henry made comment on considering additional barriers that may still bring challenges even if a school receives FARE support. Trustees Micciche and Blackburn wanted to ensure schools were selected for this support in an equitable manner. Finally, Trustee Pinkerton wanted to know the connection between FARE and the new Office of Racial Equity. Below are comments by Trustee Foreman speaking to the need to honestly assess and addresses the needs of African American students. Because this is the third time this vote has come to the board, there was limited discussion from board members. One point that Trustees Solis and Henry brought up related to how to articulate the need for a TRE approval by voters, should the board allow for it to be on the ballot. Trustee Pinkerton raised the concern around the decreasing fund balance across the years, even with an approved TRE from taxpayers for 2018. The administration is hosting two community meetings this week to provide more information about a TRE. Tuesday, 8/14 at Pinkston High School and Wednesday, 8/15 at Madison High School. Both meetings begin at 6pm. Each campus was reviewed by the administration to assess the needs of schools across Dallas ISD. Based on the administration's recommendations, campus staff will receive professional development to implement the technology plan. Two plans were presented by the administration to the board and the Superintendent made the comment that the goal would be to ensure every student has a personal device (starting in 3rd grade) and that all classrooms have audio and visual devices (LED monitor) for teacher use. The board discussion included comments from Trustee Foreman on making sure that prior to giving students a personal device, there is quality Wi-Fi on all campuses. Beyond that, Trustee Blackburn gave feedback on ensuring the technology proposal aligned with curriculum for our students. A few months ago, the governor met with leadership from Dallas ISD and made several recommendations to keep students safe (in light of recent school shootings). The administration was happy to share that half of the recommendations are already in their plans or are being implemented. Thus far this school year, Dallas ISD administration has trained all high school principals on safety - how to deal with emergencies, how to address mental health issues, and behaviors to watch for in our students. Aside from that, the Dallas ISD Police Department is able to communication more efficiently with the Dallas Police Department, and that will be critical should an emergency arise. DISD is working to have both preventative plans (mental health) as well as proactive responses to emergencies (securing entry to campuses). From the board, several trustees pointed out that the use of detectors is somewhat problematic given the fact that they require upkeep and additional personnel to be effective. The year is almost underway and the transportation team in Dallas ISD has worked to ensure students have transportation on the first day of school. From over 1,000 positions needing to be filled, the representative from the transportation team stated that the department is only 12 bus drivers short and there are still several days to fill those positions or modify routes. Costumer service is a key priority and there are a few ways to reach out to the Dallas ISD transportation team: 1) Visit the Dallas ISD website, go to 'Departments,' and click on 'Transportation' for resources; 2) Email transportation@dallasisd.org; 3) call 972-925-4BUS. Discussion from the board members included a comment from Trustee Marshall on implementing swiping and tracking abilities for all students so that parents can use an app to see if their child has made it safely to school. 1/15 Points for “Vision 1” – The Board works collaboratively with the superintendent to develop the vision and student outcome goals. 1/15 Points for “Vision 2” – “The board has adopted goal progress measures aligned to each goal. 9/10 Points for “Vision 3” – The board has adopted a vision for what student outcomes will be and has adopted constraints aligned with that vision. 0.5/5 Points for “Vision 4” – The board has adopted constraint progress measures aligned to each constraint. 0/15 points for “Accountability 1” – The board invests at least half of its time focusing on its vision and goals. 0/5 Points for “Accountability 2” – The board measures and communicates, but does not interfere in, progress toward the vision and student outcome goals. 0/15 points for “Structure” – The board delegates to the Superintendent operational authority to accomplish the vision and student outcome goals. 10/10 Points for “Unity” – The board works collaboratively with the Superintendent to lead toward the vision and student outcome goals. The new Racial Equity Department had a presentation on the three organizations which would provide racial equity & implicit bias training. The three organizations included - Pacific Educational Group, Generation Ready, and Border Crossers. As stated by Jamila Thomas from the Racial Equity Office, "The outcomes of the office are - 1) Race is no longer a determinant for one's social and economic outcome and 2) Our life outcomes can no longer be pre-determined by our race." The process includes "First, acknowledging and accounting for past inequities. Second, providing opportunities that promote racial healing (courageous conversations). Third, having targeted interventions for targeted populations." The board initially presented concerns on the training suppliers but the Racial Equity team explained the role of each organization and ultimately received positive feedback from the board. Trustee Blackburn asked about the timing of training and the Racial Equity team responded that new teachers have already received training and that top leadership will be a priority for receiving training. Setting a tax rate at $1.17, prompting a Tax Ratification Election for voter approval. Calling a bond election for - 1) $75 million for long-term bus replacement and a bus facility and 2) Refinancing an existing debt of $75 million from 2015. Selecting a method to reduce property wealth when the state recaptures funds from DISD. In the last month of the 2017-2018 school board meetings, the June Briefing agenda was packed! Below are some key issues with a summary of the administration’s presentation and the board’s response. End of Course Data was shared by the administration highlighting progress towards 2 of the 4 district goals. The data below is a sample set that demonstrates progress towards meeting the goal. The data above represents significant progress towards meeting the district goals and it is all thanks to the collective staff at the Dallas ISD campuses, the leadership of central staff, and board advocacy in support of a concerted focus on student achievement. The board did not discuss the content of the presentation at length, but, on behalf of the board, Board President Dan Micciche congratulated the district for all of its work. The administration and the School Health Advisory Council presented recommendations to the board for promoting health in our DISD classrooms and schools. The goals include vetting curriculum on an annual basis, growing representation from each district on the advisory council, and prioritizing parental engagement in support of our students’ well-being. The board discussion included concerns from Trustees Marshall, Nutall, and Blackburn about the curriculum used in classrooms. Trustee Foreman pushed for SHAC to ensure parents understand opt-out is an option. The early college high schools in Dallas ISD have been one of the more prominent initiatives in the district that have both supported student access to college as well as recruitment for new students in our district. The administration presented two new programs for the 2019-2020 school year, which will begin planning in the 2018-2019 school year. Cedar Valley College will partner with Skyline High School and 9th-10th graders will continue to attend classes on the Skyline campus while 11th-12th graders will take courses at the Cedar Valley campus. North Lake College will partner with DISD to replicate the model of Trini Garza - all four years of high school will be on the college campus. The board discussion on this agenda item came from Trustees Foreman and Marshall asking the administration to explore additional funding options for early college programs. This assessment, NAEP, was administered to 4th and 8th graders for reading and math. Typically, the results from this exam are compared to district across the country and do not account for the demographic of students that make up the district. For that reason, the administration compared the makeup of Dallas ISD to the make up of comparable districts and found that in math, our students are performing above average and in reading, our students are performing on average. Board discussion from Trustees Resendez, Foreman, and Marshall related to reinforcing reading and reading initiatives across our schools. The budget presented by the administration included an assumed tax increase for Dallas ISD taxpayers. If the tax increase passes through a Tax Ratification Election first through the board in August and then through a ballot vote in November, DISD employees will see a pay increase for their salaries. If the tax increase does not go through, there are no plans for a pay increase for staff. Trustee Blackburn: Pay increase should not be dependent on an increased tax rate. Trustee Foreman: Community should be a part of the budget proposal and a tax attorney should approve the budget proposal with its tax rate assumption. Trustee Marshall: Supportive of pay increase for teachers who have met specific performance metrics in their evaluations; concerns about where money should go without strong consideration of where the money would come from. Trustee Pinkerton: Wants administration to ensure that there are adjustments to central staff costs as well, not just adjustments to campus costs. Trustee Nutall: Wants to ensure investment in early childhood matches retention of students. Trustee Resendez: Interested in how funds will be spent for racial equity work. The administration named retention strategies for our DISD students as well as recruitment efforts to gain additional students who are not currently served by the district. Kinder & Bridge Camps - This is designed to help students in their transition years of Pre-K to Kindergarden, Kindergarten to 1st grade, 5th grade to 6th grade, and 8th grade to 9th grade. Students would have the opportunity to visit the school they would attend the following year to begin to get acclimated. Summer Connection Fair, Open House, and Customer Service Training are all strategies used to invite family engagement to feel connected to the district and to learn more about the schools in their communities. There will be a Recruitment Team on every campus and marketing efforts from DISD staff will continue to invite current and new families to learn about DISD. A campus-based initiative known as Operation Comeback will focus on calling students who are enrolled but not showing up to school once the school year begins. The annual Discover ISD fair will be hosted in two different locations to accommodate families across our district and offer a showcase of the many different schools and special programs DISD has to offer. Board discussion included suggestions from Trustee Foreman to visit churches, add suggestion boxes on campuses, and have the Superintendent do a robocall to households in the district. Trustee Marshall asked the administration to ensure our schools are prepared to offer school tours as parents show interest in visiting our campuses. Trustee Micciche reinforced outreach efforts that match or exceed the tools charter schools use to engage families. DISD currently offers programs that are geared towards preparing students for career immediately following high school graduation. However, the administration saw the need to better align the certificates and expectations of the industry with the DISD program offerings. With that, the administration proposed enhancing the qualities of existing programs and eventually striving to have an industry partner at each DISD high school. Board discussion included Trustee Foreman’s comment that we cannot leave out schools that do not have any programs, and not only strengthen the existing programs. Trustees Flores and Pinkerton offered their help with finding new partnerships for our schools. If you have any questions about the June Board Briefing, please do not hesitate to visit the Dallas ISD Board Meeting Agendas Website, or email our team at info@dallaskidsfirst.org. Goal 1: Student achievement on state assessments in all subjects at “Approaches” or above will increase from 66% to 75% by 2022. Goal 3: Student achievement on state assessments in two or more subjects at “Meets” or above will increase from 34% to 40% by 2022. Our board expressed pride in the hard work of the students, teachers, leadership teams, and district administration in making this happen. The administration presented the possibility to use Senate Bill 1882, which allows school districts to partner with charter schools (and other eligible entities). In this particular partnership, St. Anthony’s - used to be a private Catholic school but is now a charter school - would have autonomy under governance, staff, schedule, curriculum, etc. The district would provide a school facility - Wheatley - and an advisory board that has continuous conversation around programs and student achievement at the campus. The board had mixed support - Trustees Nutall, Foreman, Flores, and Blackburn showed support for this partnership; Trustees Pinkerton and Marshall were concerned about not receiving anything in return that would benefit the district’s budget; Trustee Solis had a mixed reaction of fascination about the concept and concern about unanswered questions; Trustee Micciche expressed the need for researching all necessary aspects before deciding to move forward; and Trustee Resendez did not publicly state an opinion on the matter. A consulting team, Engage2Learn, alongside the administration, reported on a plan to implement technology and update facilities over the next couple of years. One of the highlights from the technology standpoint was an effort to provide a technological device (chromebook) to each student in the district - but if funding did not allow for it - to at least provide a device for every single high school student (elementary students and middle school students would share). From a facilities standpoint, two major priorities in the next couple of years include replacing all equipment in buildings whose lifespan has or will expire in the next two years as well as modernizing classrooms (wall paint, new floor, whiteboards instead of chalkboards). The immediate next step will be to finalize a plan for technology and complete the facilities assessment across Dallas ISD campuses. The administration and superintendent presented the budget for the 2018-2019 school year. One major difference is that the budget was presented assuming a higher tax rate for local residents. The projected enrollment, which impacts the budget, is a decrease of just over 1,700 students. In addition, state funding would decrease by 6.9% and federal funding would decrease by 2.4%. For a full video of the meeting, visit https://www.boarddocs.com/tx/disd/Board.nsf/vpublic?open. To ask questions about this summary, please email info@dallaskidsfirst.org. Our students across the country have been taking center stage in the past few weeks by leading efforts for change. They have served as role models not only to one another but to the adults who are in positions of leadership, especially those in elected office. At a local level, Dallas students have also voiced their thoughts. After discussing the role of the school board in Dallas ISD with middle and high school students, our young leaders have some things they’d like to share with our elected trustees. With students advocating for technology, more electives, funding for schools, and equity across schools - it is critical to keep these leading voices front and center. With 2,791 District 9 students enrolled in a campus with an “Improvement Required” label and two qualified candidates stepping up to run, Dallas Kids First is endorsing a vote for change in leadership. For nearly a decade, District 9 in Dallas ISD has had the same school board member in office. In 2012, Dallas Kids First endorsed this member, but by 2015 could no longer stand behind a voting pattern that raised more questions than it did solutions. With a narrow victory in 2015, the incumbent was able to stay on the school board for another three years. Of 3,922 voters, 52% supported the incumbent; and only 7% of eligible, registered voters participated in this decision. A combined 2,106 voters chose to re-elect the same leadership for a total of 29 schools - representing 23,696 students and even more households. While other members on the board have led policy efforts to make sure Dallas ISD students across all campuses have their needs met (breakfast for students, restorative discipline policy, etc. ), the current trustee has missed opportunities to address the concerns of a diverse District 9 community, and an equally diverse Dallas ISD consituent-base. Passing the baton to a solutions-focused representative on the school board would be a positive change for Dallas ISD and District 9. In the 2016-2017 school year, Dallas Kids First tracked high-impact decisions voted on by the school board. These decisions translated into board members voting on items that could either help or hinder students, teachers, and effective school board governance. On average, the Dallas ISD school board supported these topics with 90% approval. In District 9, these high-impact votes were supported 68% of the time. Local elections matter and a development of civic engagement across the nation has inspired the local Dallas ISD school board race for District 9. Campaign season typically starts closer to March, but 2018 brought an early start for a community ready to cast a vote. By November, two promising candidates publicly shared their interest in running for the same school board seat as challengers to the sitting incumbent. Two experienced individuals running at the same time for the same seat further highlight an inspired base of new leaders looking to get involved - not just at the voting poll, but on the ballot. Given the qualifications of both candidates, Dallas Kids First considered four options throughout the five-step endorsement process. Considering the interview panel, community input through DKF’s endorsement survey , and the DKF advisory team, it became apparent to all: By endorsing Edward Turner, DKF would be denying the fact that Justin Henry is deeply invested in supporting student outcomes. By endorsing Justin Henry, DKF would be ignoring Edward Turner’s commitment to the community in support of schools. The DKF team works year-round alongside schools, educators, community partners, and elected officials to advocate for student outcomes. By not making an endorsement at all, all efforts would have been in vain and not aligned to mission - raise awareness, organize voters. Henry and Turner are each rising stars for the local landscape and, in making a dual endorsement, Dallas Kids First is positioned to support each of their campaign efforts - all while shedding light on missed opportunities for District 9 in the last nine years. With an evolving education landscape, it is time for the leadership in District 9 to evolve too. Find out if you or your friends can vote for this election here! Find out if you are registered to vote here! Click here to read Justin Henry’s “Issues” page. Click here for some critical ‘NO’ votes by current District 9 incumbent. For Districts 1 and 3, Dallas Kids First stands behind unopposed incumbents and DKF-endorsed Trustees Dan Micciche and Edwin Flores, respectively. For District 9, Dallas Kids First supports a vote for change in school board leadership via a dual endorsement, empowering voters to support one of two strong candidates suited for leadership. Dallas Kids First endorses Justin Henry and Edward Turner for Dallas ISD School Board. After completing its 2018 endorsement process - a combination of candidate questionnaire responses, a community interview panel, and community survey responses - Dallas Kids First endorses a vote for change in leadership by empowering voters to choose one of two strong candidates, Justin Henry or Edward Turner, for Dallas ISD's District 9. Our community panel was made up of 25 members, including current DISD students, teachers and staff, District 9 residents, CAMP Fellows, and DKF members. Founded to address years of low voter turnout, Dallas Kids First continues its efforts to make school board candidate information more accessible to a diverse constituent base. The Dallas Kids First scorecards outline candidates' strengths and areas of growth aligned to qualities of effective board leadership. With the election just two months away, Dallas Kids First is calling on Dallas ISD constituents to commit time and resources to increase participation in the May 5, 2018 election. Advocate alongside DKF and let us know your interests by clicking here: https://www.dallaskidsfirst.org/volunteer/. Each candidate's scorecard along with their questionnaire responses are available on the 2018 election page, https://www.dallaskidsfirst.org/2018-elections.